Nancy Turnbull- Original Art Click an image to see artwork framed. …she moved with her family to live in Worcestershire but returns ‘home’ whenever possible on holiday. 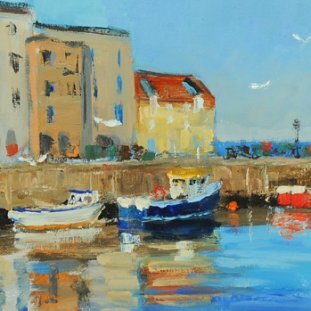 Although originally graduating in Biochemistry at the University of St Andrews, she has always been interested in art and has been painting seriously for about 7 years. She was taught by Ann Johnston at the Green Gallery in Aberfoyle. In addition to the Morningside Gallery, Nancy also exhibits in galleries in Worcester and has had work accepted for the past two years at the Royal Birmingham Society of Art.She paints still life and landscape with equal enjoyment. The effect of light and the mixing of colour are very important in her work. 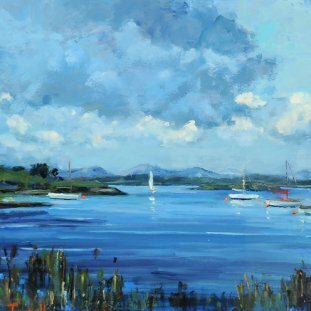 She uses very little brush work, preferring to apply the paint with a knife and fingers to achieve a rough, textured effect.A love of Scotland, and of the Scottish islands in particular, is reflected in her work. 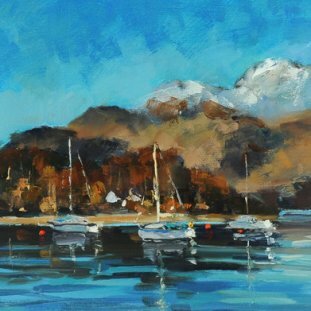 A desire to capture something of the muted light and shadow and the soft, gentle tones typical of Scottish landscapes causes her to return to Scotland to paint time and again.